PodBrix are back! I love limited edition Podbrix. And this one is smack dab at the intersection of nerdy and cute. Plush Jobs loves you. Cuddle up with him and pretend he's whispering corporate secrets in your ear. Jobs enjoys hanging out with your other stuffed animals... also he adores Barbie. But please keep him away from computers running Windows, he hates those. Plush Jobs would like you to know that he is completely handmade and that his glasses are constructed from wire. He also mentions that even his shoelaces are hand stitched. 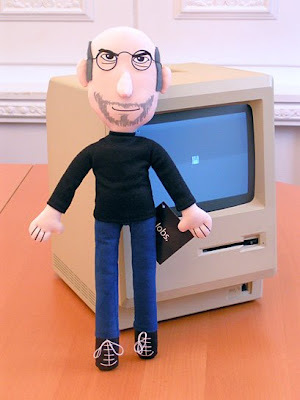 Plush Jobs says that he is quite tall at 43cm (17" inches) high. He thinks it would be very nice to live at your house. The photo of plush Steve laying in bed is hilarius. Oh, and that Mac Classic he's leaning against even has the happy face Mac icon that my old classmate Susan Kare designed. I miss that happy computer face!